Radish is an important vegetable crop and has several agriculturally useful traits to improve the breeding of Brassica crops, which include cytoplasmic male sterility, resistance to pod shattering, tolerance to saline soils, and resistance to nematode and diseases. To transfer these traits into Brassica, a number of intergeneric hybridization have been performed using intergeneric cross and/or protoplast fusion, and it was shown that some of them were introduced successfully into and expressed in Brassica or hybrids with Brassica. The various kinds of hybrid progenies such as synthetic amphidiploid line, alloplasmic line, alien gene(s) introgression line, and monosomic alien chromosome addition line would be valuable genetic resources not only to breed more useful cultivars but also to analyze each chromosome and gene concerned. Recently, the development of numerous molecular markers for genetic study has been accelerated in radish, and a high-density linkage map has been constructed. These molecular tools have been used for the identification of QTLs associated with important agronomic traits of radish, genetic analysis of hybridization barrier between radish and Brassica crops, and comparative genomics of Brassicaceae. 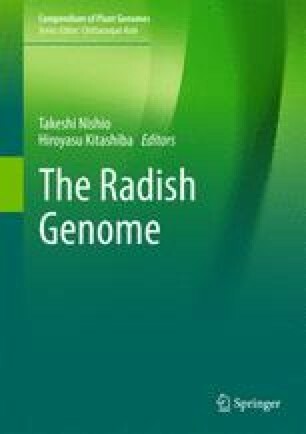 The further accumulation of genome information will facilitate the cloning of candidate genes in QTLs and the marker-assisted breeding in radish, in addition to the intergenomic transfer of useful radish genes into Brassica crops through intergeneric hybridization.